creative savv: I feel good, because this week, I saved time and money by . . . I feel good, because this week, I saved time and money by . . .
. . . cooking several meals and snacks ahead of need. I was out of commission for the early part of this week. I injured my back on Sunday, then pulled a muscle in my calf on Monday. I was a hunched over, hobbling mess. The real difficulty came late Tuesday afternoon when I realized that there was virtually nothing close to being ready to have for dinner, and I was in no shape to make beef stew, as I had planned. My two daughters stepped up for me and made a delicious split pea soup and a batch of carrot muffins, all from scratch. But this took away from their time for homework. Not good! When my kids open the refrigerator and pantry doors a hundred times and call out, "Mom, there's nothing to eat!" I know that this is family code for, "there's nothing prepared that I can pop into my mouth!" Which, for me, means it's time to get busy, get creative and use what I have to make several snacks, treats and drinks. So, pain or no pain, I had to get some things prepared so that we could actually eat around here. Looking into my fridge on Wednesday, you'd think I'd stolen a page out of a nursery rhyme. Or is it? A little "Mom Magic" and we'll just see if we can't transform this emptiness into abundance. 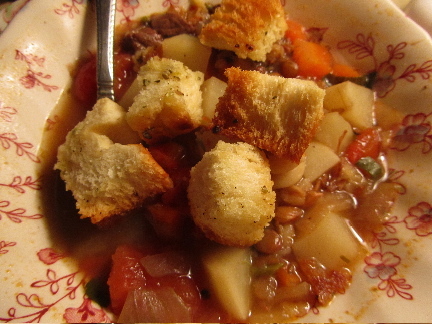 I also used the last of a loaf of French bread to make croutons for the soup. Wow, those were yummy, and easy! I cooked up a large pot of rice. 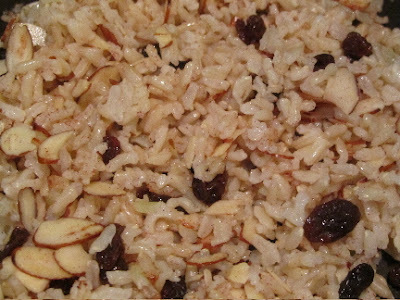 With the rice, I can quickly make a fried rice supper, or rice and lentil pilaf, or my favorite breakfast and lunch when I'm going both gluten and dairy-free, rice with almonds, raisins and cinnamon. And while we sat and ate dinner, I had a pot of maple and brown sugar oatmeal cooking for tomorrow's breakfast. And that was it for my big cooking spree on Wednesday -- I had to lie down. Thursday morning, I got myself into the kitchen again to prepare ahead of hunger and need. 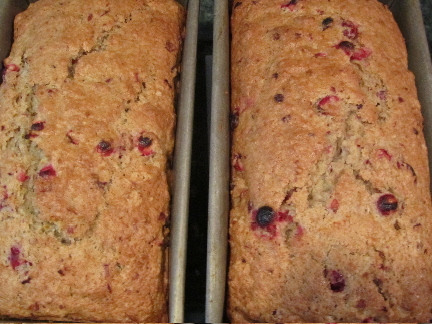 I made a double batch of cranberry-orange bread. Making quick bread takes less hands-on time than a large batch of muffins, with no individual cups to fill. I could get back to resting my back sooner. One daughter likes healthy snacks, so I used the food processor to shred carrots, and made carrot-raisin salad, enough for her snacking, and for our dinner on Thursday. Another favorite snack in our house is popcorn. I like to change things up a bit, so this time I made Southwest-style popcorn. 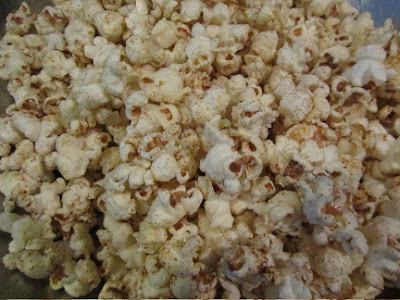 It's just popcorn with chili powder and cumin sprinkled over it all. And of course, a pitcher of lemonade (from bottled lemon juice and sugar) to wash down all these snacks. 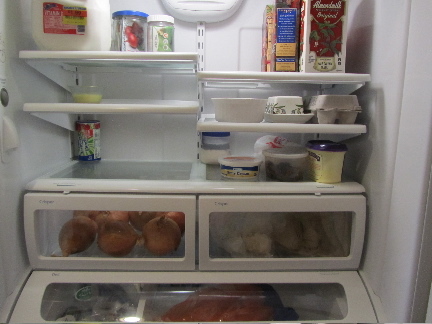 Now, take a look inside my fridge -- abundance once again! And just about everything that I made was either quick and easy, or saved me time in the long run, because I made extra for future snacks and meals. Like I said, I didn't whip this all up in a tornado-like fury. No, I was hobbling about, and did this over a 2-day span. I chose mostly uncomplicated foods to prepare, and I used my food processor, when possible, to lighten my work. So, it's definitely a doable solution the next time my family screams, "Mom, there's nothing to eat!" Have you used any "Mom Magic" lately? Is there something that you've done this week that saved you time and/or money, and made you feel good? Sometimes an empty fridge is a blessing. You can finally wipe down the shelves, for one thing. But also, I love the challenge of creating abundance when it appeared there was nothing much there. How about you? Sorry to hear about your injuries! Ouch! My kids will periodically tell me, "Mom, you need to bake!" and they are always right! Thanks. My back and leg are healing. It's strange to have a couple of things go wrong at the same time. 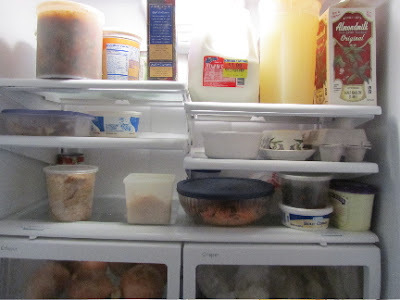 Well, if your fridge is bare but freezer full, then you have the best of both worlds -- you have plenty to eat always, and very little goes bad sitting in the fridge!! Our fridge is often stuffed to the gills, mostly because it's one of the tiny counter-depth fridges that holds what seems to me like practically nothing. And also, we have a lot of condiments taking up space. Fortunately, baking will usually take care of the "Mom, there's nothing to eat!" You are absolutely right that the lament of "There's nothing to eat," means that there is nothing quick and easy to eat. I know that this applies to me as well as everyone else who lives here. However, as you showed us, most of the time there is something to eat even if it requires a little effort--usually less than we think. Your family is really lucky to have you. You hobbled around with a bad back and foot and made sure that they were well taken care of. Kudos to your kids for stepping up and doing the same thing. I think that all of our families are lucky to have us. In just about every family I can think of, it's the mom who makes sure that there's always food available, even while sick or injured or under a deadline with work or a project. I wonder how much of that is part of the nature vs. nurture debate? Anyways, we all deserve a huge pat on the back for our dedication and hard work. Yeah, my daughters did a great job and even offered to do dinner several other nights. But their cooking does take quite a bit of time away from homework, and I just don't want them to fall behind because of me. Oh no... I'm so sorry that you're feeling poorly. It just makes everything more difficult, doesn't it? Anyhow, I cook & eat like that in general. I really enjoy cooking, but not when I feel like it's something I have to do. It helps that I'm not feeding a family. But in general I make big batches of stuff and then either just keep it in the fridge for easy grabbing, or freeze it in meal-sized portions. Usually I do some of both. That way there's always something to grab and scarf when I'm hungry, and cooking can remain a fun hobby, not a day to day obligation. I also discovered a few years back that when preserving garden produce, I'm much more likely to eat it if I've prepared something from it and frozen the prepared food rather than just freezing the veggies. Case in point... I had an abundance of zucchini, pumpkin & other squashes last year. I made a pile of soups, quiches and quick breads and froze those - and at this point I'm down to just a few loaves of zucchini bread left in the freezer. BUT, the year before I froze 5 gallons of pumpkin puree and STILL haven't gotten around to using it! It's like the difference between opening the freezer and going "Yes! I've got food!" vs. "Oy! I've got work!" Thanks, I'm slowly healing. This getting old thing is rough! I try to make time to cook large batches and freeze. It doesn't always work out for me, though. And we had completely run out of my freezer stash this time. That's a good idea to cook with your garden harvest, to freeze, right then and there while everything is fresh. It does make a difference, to see ready to eat food vs. ingredients. I think I just finished off my pumpkin puree from the freezer. How many pumpkins did you cook the year you had 5 gallons of puree? I'm pretty sure I had less than that, and I had about 15 or so pumpkins this past fall. You know, in the Tightwad Gazette, the author writes about thawing a bunch of pumpkin puree and making about a dozen pies at a time, then freezing them. You might be able to do something with the frozen pumpkin puree, in a large batch, then freeze the cooked item. Live and learn has a really good and simple, curried peanut-pumpkin soup recipe on her blog, I think from late January. I've made it several times now. Well, I think batch cooking is much easier when you're only feeding one person - what would feed your family for one night will feed me for a week! Gosh, I'm not sure how many pumpkins it was, but it was in the ridiculous category - like 50 or so. The past few years I've had a bumper crop, and most have been volunteers. That's one of the bonuses of being a lazy composter... the compost ends up full of seeds that just start growing, and I just never have the heart to pull them up once they start to sprout! Most were pie pumpkins, but there were some "mystery squash" in there too. I'm sorta afraid to mention that I've also got about 25 winter squash of various varieties from this past year that are still hanging out in the basement where they got dumped last fall. Most are still good, but I fear I may never be able to eat my way out of this backlog! I've done about 10 different kinds of pumpkin soup, but I'll have to try the peanut one. Anyhow, hope you're feeling better soon! Wow! 50 pumpkins. You must have a very large garden. I know what you mean about not wanting to pull up the volunteer "babies". One year I had at least a dozen volunteer acorn squash, scattered all about our yard. I let them be, figuring the blossoms would be pretty at least. We ended up with about 30-40 squash that year. I gave them away to anyone who would take them. Pumpkin is versatile, but I'm not sure it's 50-pumpkins-for-one-person worth of versatile. Good luck with all the pumpkin and squash. Would a food bank take any of the whole squash? I'm so glad, Kris! I hope that you enjoy the selection of teas as much as I do. Hmmm, Easter fish. Jesus ate fish, many of the disciples were fishermen. Maybe you have something there! Hope you're back to full strength soon, and Happy Birthday to your daughters!! Thank you, and I passed your birthday greetings on to my daughters! That's really kind of you to remember! Thank you. I'm slowly returning to normal. 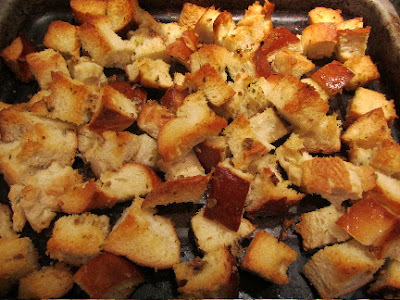 Homemade croutons are the best -- I like to make them big and chunky! I am truly sorry that you have had such a difficult and I know very painful time with your back and calf. I sincerely hope that you are recovering well and that your will be back to full speed this coming week. You certainly made the most of what you had!! I am very impressed with your food management and culinary skills!! Such great ideas you shared and all of your cooking looks very delish! Please let your family take care of you! I am getting there - almost normal, not jogging, but I can walk without a limp finally. Thank you for your kind words. My husband and kids have been a tremendous help this week, and i appreciate them enormously. We had a family birthday yesterday, and I never would ahve gotten everything done without them! Thank you. I am improving every day, and that's the right direction to be headed. Mmm, I love cranberry-orange bread. I'll post the recipe that I use in a few days. It's a fairly healthy recipe, using half whole wheat, half white flour, and I think a reduced sugar and oil content, using orange juice for some of the sweetening. Lili, I hope you feel better soon. I sure know what it's like to injure a back. I broke mine when I was 19 and it still will act up if I'm not careful in how I use it. My boys were famous for telling me there was nothing to eat, even if the pantry and fridge were fully stocked. Yes, it only meant they were too lazy to make a meal. On the other hand if I had already cut everything up and had it ready it would be eaten in no time. Thank you. I am doing better and better each day. But this was a bit of a wake-up call for me to take better care of my back. I think with my kids and the "there's nothing to eat" plea, is that they just don't have as much kitchen experience to see the possibilities. To them, when they open the pantry, they see containers of dry oats, rice, popcorn kernels, dried beans and peas, not steaming, flavorful oatmeal, fried rice or rice pudding, a big bowl of fluffy popcorn, or bean burritos or soup. I guess that ability to see the possibilities comes with experience and hunger! So sorry to hear about your injuries. I love the idea of making a loaf rather than individual muffins - saving time and fiddly washing up. And completely off-topic, hope your girls had a good birthday. I'm guessing they turned 18 and was wondering if that's a big birthday in the US? It is here, because it's the age that you can legally drive and drink alcohol (not at the same time! ), so we usually have a big party. Thank you. I should be back to full-speed soon! And thanks for remembering it was my daughters' birthday. And yes, they turned 18 -- woo hoo! I can hardly believe it. 18 is big here too, mostly because they are now considered adults. Although, the driving requirement here is 16, and drinking is 21. I'll share more about their birthday (and how this frugal family celebrates birthdays) in tomorrow's post. Good save on the brownies! I hope your field trip weekend was a success. Hope you are feeling better. You did a great job in your two part session. thank you. I am doing so much better this afternoon. I've spent the day trying to catch up on all the things I let slide last week -- but then you know how that feels, right? Can't wait to hear more details about your new grandson!